I monitor several search results in Brisbane Australia simply due to Google’s odd behavior in the search results, and, watching SEO worldwide keeps us sharp over here, too. Also, results are often quite different there than they are here in the US. Shameless plug: If you are a Brisbane personal injury lawyer looking for more exposure in search, please feel free to contact us. We have plenty of references available in the personal injury world and various clients in Queensland as well. You can also visit our page dedicated to personal injury lawyer content & SEO. Google Pigeon came to Australia in December 2014. Since then, the local results have been a little unpredictable throughout Australia (in the US, local results usually mirror organic rankings very closely). Brisbane is no different, as seen in this image below. 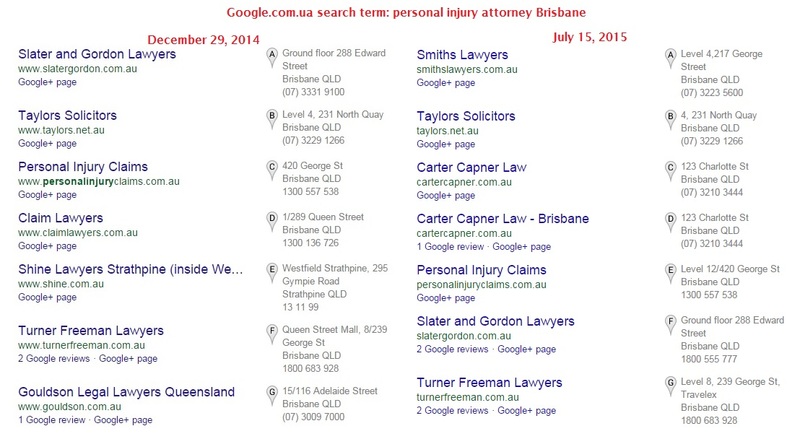 December 2014 local results vs July 2015 local results for search term personal injury attorney Brisbane. Another note on the local results: In Brisbane, there are often 3 organic results above the local pack (via desktop search). 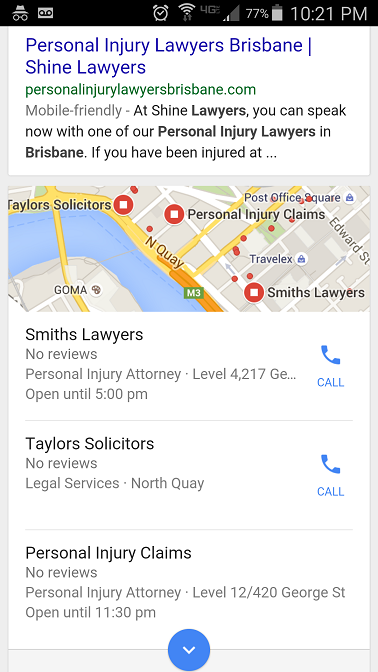 In mobile search, Google.com.au returns 1 organic, then 3 local search results. Here’s a screenshot of mobile search results. How are law firms ranking? Links & content. Consistent, relevant content, and backlinks are by far the most important things you can do for your website. I won’t mention who has which links but rest assured that links are the primary reason most sites in the top 10 are ranking. Things in Brisbane are not nearly as competitive as they are as in places like Los Angeles. Some attorneys are even ranking by submitting their sites to several legal directories. Sites like this are not very powerful, and most directories should be avoided. One legitimate directory is HG Australia. If a law firm wanted to boost their page from page 2 or 3 on to page 1 it could be done with the right SEO assistance. personalinjurylawyersbrisbane.com – This site is owned by Shine Lawyers and is running WordPress. Separate from their primary site, www.shine.com.au, the site has surprisingly little content and features large lead captures. 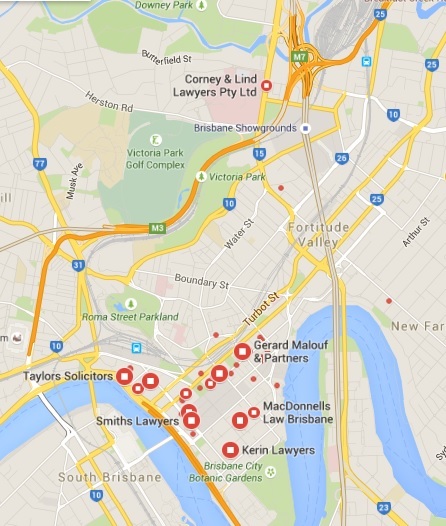 There is no local search result for this site as the local pack results are for law firms with staffed offices in Brisbane. www.corneyandlind.com.au – Corney and Lind have a WordPress site, good links, great reviews, and lots of content. You would think that they’d show up in the local pack / local results, right? Not in this case. Their Google My Business page is configured as “attorney” rather than “personal injury attorney”. Maybe this is intentional as they practice in several areas of law. I don’t think it is the case, however, in the past some businesses would not show up in local search results if they were “too far” from the other grouping of local businesses. In this case, many attorneys are located near eachother and Corney and Lind is a bit North as seen in the image below. www.thepersonalinjurylawyers.com.au- This site appears to be a landing site put in place by McCowans (http://www.mccowans.com.au/). www.smithslawyers.com.au Smith’s Lawyers is running a nice looking WordPress site and adding miscellaneous content to their blog. www.cartercapner.com.au – Carter Capner Law – Another great looking WordPress site, and, they have a great blog. They’re hogging up 2 spots in the local results, probably by mistake. It is rare Google displays listings like this. www.taylors.net.au – Taylors Solicitors has a lightweight, custom website. www.turnerfreeman.com.au – Turner Freeman Lawyers – Another WordPress site. This one has a blog and has a lot of pages and content to it. I like how they broke down their team members and I’m sure some clients appreciate that. kerinlawyers.com.au – WordPress, plain and simple. I feel like I wrote the blog – it has articles on it which answer potential client’s questions, which is what people are looking for once they’ve been injured. It appears that they are putting up an article once every month or two. www.eastcoastinjurylawyers.com.au – Not sure what is going on with this site. Is this a law firm called “East Coast Injury Lawyers”? www.brissyinjurylawyers.com.au, www.motorvehicleinjurylawyers.com.au, and www.workplaceinjurylawyers.com.au appear to all be the same people. This site does not rank in the local pack. Things are a bit of a mess in Queensland. Landing pages, people with several websites, good sites not displaying properly, local results pulling attorneys from page 2 of search results, wow. There is a big opportunity here and definitely room to rank on page 1 for law firms who want to build out a legitimate, long lasting web presence. There is room for more content, and there is definitely room for more reviews. In competitive cities in the US there are attorneys with 50, 80, 100 reviews- I’m shocked at the lack of reviews in the local pack. This could be remedied with reputation marketing. I enjoyed your blog. I have just started the process of looking into SEO. Our firm has under 10 backlinks- bad right! Keep your eye out for Revolution Law changing up the Google Search Results in the coming months. I am only just starting to understand the value of quality SEO and I am looking forward to climbing the google ladder.